Hoboken, New Jersey – May 233rd, 2017 – The Midwives of New Jersey recently announced that they are now offering midwifery care in Hoboken, NJ, delivering out of Hoboken University Medical Center. 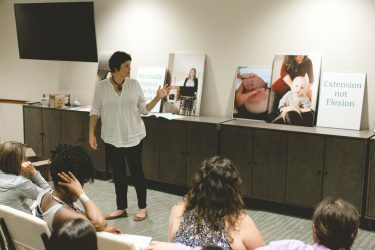 Since 2010, the Midwives of New Jersey have worked toward the growth of Midwifery in the state of NJ, opening practices in Hackettstown, Madison and delivering out of Morristown and now Hoboken. The practice’s goal is to improve pregnancy and birth outcomes through the application of the Midwifery Model of Care, treating pregnancy and birth as part of the normal physiology of a woman’s body. “We are honored to have the Midwives of New Jersey and their vast experience and expertise as part of Hoboken University Medical Center at CarePoint Health – Hoboken University Medical Center. We are pleased that we can now offer our patients options for natural childbirth and/or low-intervention,” said Meika Roberson, CMO of Hoboken University Medical Center. Hoboken University Medical Center recently renovated their Mother-Baby Unit and it is very client-comfortable. The Midwives of New Jersey will be working with Hoboken University Medical Center to create 2-3 birth suites that will be designed to support women through physiologic birth. The hospital also recently added nitrous oxide to assist laboring women cope with anxiety and pain. “Hoboken University Medical Center has welcomed us with open arms. They have hired midwifery-friendly staff, trained their nurses about the Midwifery Model of Care and purchased an assortment of Mother-Friendly tools like wireless waterproof monitors, waterproof dopplers, birth tubs, birth balls, massage sticks and squat bars. They are all in and we are hopeful that our practice will be part of making Hoboken University Medical Center one of the premier birth facilities in the state of New Jersey” said Lisa Lederer, CNM & President of the Midwives of New Jersey. 2017 will be another year of tremendous growth for the Midwives of New Jersey as they publish Lisa Lederer’s book on the topic of avoiding a Cesarean Section; host a major two-day conference in November for parents and birth providers; add WellnessCare Pediatrics and Preconception planning to their current offerings; and open a third office in Hoboken, New Jersey. For more information about the Midwives of New Jersey visit midwivesofnj.com. The Midwives of New Jersey, a woman-centered midwifery practice in Northern New Jersey, have been providing women with evidence-based information and choice in birth based on the midwifery model of care for over a decade. As the premier provider of prenatal care in the state, they offer women options including: Homebirth, Hospital Birth at Morristown Medical Center and Hoboken University Medical Center, Waterbirth, VBAC, WellCare Pediatrics, Preconception Care, Complimentary Nutritionist Sessions, Prenatal Massage, Chiropractic, Postpartum Support and Classes including Welcoming Birth, BabyCare, Breastfeeding and Childbirth, Weekly Lactation Circle, Mother’s Care, Monthly Mother’s Group, & more. They believe that their job as Birth Workers is to educate and support, to only step in when necessary, and to Serve Women and Honor Birth. They work to encourage and support women in natural birth, enabling them to see how incredible and powerful they are; changing them as women & as mothers forever. To learn more visit our website at midwivesofnj.com. CarePoint Health brings quality, patient-focused health care to Hudson County. Combining the resources of three area hospitals – Bayonne Medical Center, Christ Hospital in Jersey City, and Hoboken University Medical Center – CarePoint Health provides a new approach to deliver healthcare that puts the patient front and center. We leverage a network of top doctors, nurses and other medical professionals whose expertise and attentiveness work together to provide complete coordination of care, from the doctor’s office to the hospital to the home. Patients benefit from the expertise and capabilities of a broad network of leading specialists and specialized technology. And at CarePoint Health, all of our medical professionals emphasize preventive medicine and focus on educating patients to make healthy life choices. For more information on our facilities, partners and services, visit our website, www.carepointhealth.org.